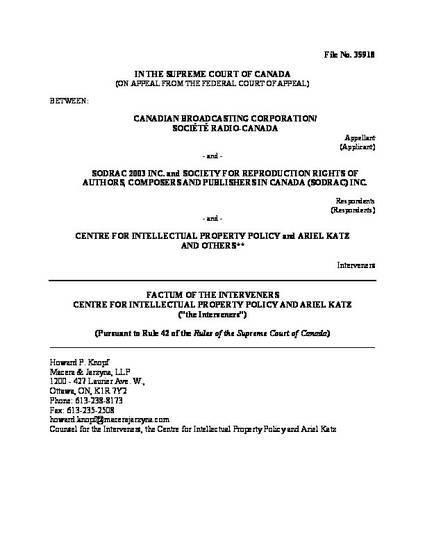 Interveners factum filed by the Centre for Intellectual Property Policy at McGill University and Professor Ariel Katz in the CBC v SODRAC case before the Supreme Court of Canada. The Court granted us leave to intervene with respect to the question of whether tariffs that the Copyright Board approved can be imposed on users. In the decision below, the Federal Court of Appeal (“FCA”) held that a collective management organization (“CMO”) can ask the Board to approve a licensing scheme and then impose it on users. If correct, such users then have no choice other than to deal with the CMO, and must, as a matter of law, pay the entire specified royalties if they make even a single unauthorized use of a single work from the CMO’s repertoire. By so ruling, we argue, the FCA has upended the legislative scheme. This factum explains why the holding of the FCA (which we call the “mandatory tariff” theory) lacks basis in law: standard principles of statutory interpretation contradict it; the case law debunks it; and the legislative history discredits it. In addition to absurd results that contradict fundamental tenets of the rule of law, the “mandatory tariff” theory threatens to upset the balance in Canadian copyright law. It would overly compensate owners, contrary to this Court’s holding in Théberge, and it could gut fair dealing and others users’ rights, contrary to what this Court cautioned against in CCH. Spoiler alert: The Supreme Court agreed with us. See Canadian Broadcasting Corp. v. SODRAC 2003 Inc.,  3 SCR 615, 2015 SCC 57 (CanLII), <http://canlii.ca/t/gm8b0>, paras 101-113.